Joseph Lin will become the first violinist of the Juilliard String Quartet in 2011, Juilliard President Joseph W. Polisi announced on October 22. Lin, 32, replaces Nick Eanet, who was the storied quartet’s first violinist for just one year before resigning in June due to health reasons. Joseph Lin will join the Juilliard String Quartet in 2011 as the ensemble’s first violinist. Left to right: J.S.Q. 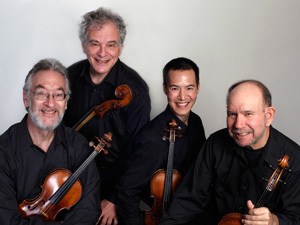 members Ronald Copes, violin; Joel Krosnick, cello; Lin; and Samuel Rhodes, viola. “We firmly believe that [Lin’s] deep thoughtfulness about music will add a remarkable voice that will embrace and complement the ongoing dialogue that has always been a strong characteristic of the Juilliard Quartet,” the ensemble’s members said in a joint statement. Lin is a graduate of Juilliard’s Pre-College Division (’96), where he studied with Shirley Givens, and Harvard College. Last year he led a project with Cornell composers to study Bach’s Violin Sonatas and Partitas and create new music inspired by them. He has also made an extensive study of Chinese music and organized Cornell’s Chinese Musicians Residency, which was inaugurated in 2009. A founding member of the Formosa Quartet, Lin won the 2006 London International String Quartet Competition and has recorded music by Korngold and Busoni (on Naxos) as well as Bach and Ysaÿe (on N&F). The Formosa Quartet’s debut CD was released by EMI. His performances during the 2010-11 season include appearances with, among others, the Ukraine National Philharmonic, the Yomiuri Symphony in Tokyo, and the Taiwan National Symphony, as well as chamber performances at Weill Recital Hall, the Seattle Chamber Music Festival, the Tucson Winter Festival, and the Marlboro Festival. Lin is only the 13th member of the Juilliard String Quartet, which was established in 1946, and just the fourth person to serve as first violin despite the quartet’s long history. When founding first violinist Robert Mann retired from the ensemble in 1997, he was replaced by Joel Smirnoff, who left to become president of the Cleveland Institute of Music in 2008. Juilliard alumnus Eanet, who replaced Smirnoff, announced his resignation from the quartet last summer due to a chronic digestive disorder that he said made the group’s extensive touring difficult for him. He will keep performing with the quartet this season, including in two Daniel Saidenberg Faculty Recitals at Juilliard, on December 2 and February 21.